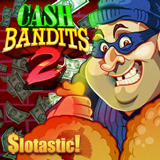 This week Slotastic introduces the Cash Bandit 2 slot, a sequel to the fun bank robber slot from Realtime Gaming. It's now in its download, instant play and mobile casino and some nice introductory bonuses are now available. Until the end of this month include 50 free spins. Deposits up to $444 will be doubled with 44 more free spins thrown in for good measure. The same bunch of bandits that have been entertaining players all over the world in the original Cash Bandits slot are on the loose again in Cash Bandits 2. The loot in this heist includes a free spins feature with massive multipliers and two progressive jackpots. If you can crack the safe you'll win up to 100 free spins with 5X multiplier. In this new game, the Wild is grouped and covers the entire reel it appears on, creating more possibilities for winning combinations. Sequel to popular bank robber slot game features free spins with massive win multipliers. The Cash Bandits 2 slot has two randomly awarded progressive jackpots ($250 and $1000) which can be won on any spin.